Crop progress reports have given the bulls some optimism as overnight price action has corn and wheat prices up +1%. Soybean markets are doing their best to come along for the ride but remain lagers as there is little negative news about bean production floated like there is in corn and wheat. December Cotton markets are back down near yesterdays low in a low volume overnight trade. Crop progress is the story this morning in corn and wheat. 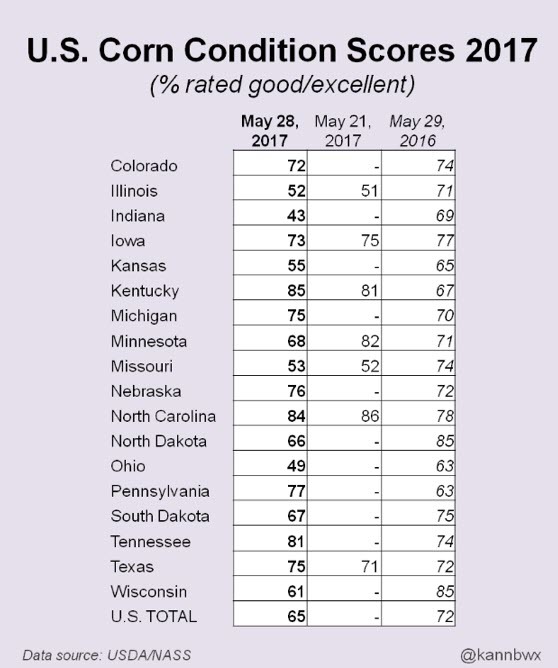 Corn markets should take the headline lead here given the idea USDA provided yesterday that 2017 conditions are off to a worse start everywhere other than Nebraska than the record 2016 crop we saw last year. 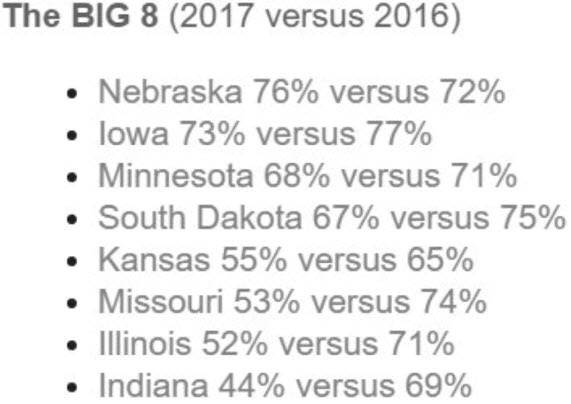 The concerns lie in the east where Indiana and Illinois are facing a tough road to a trend yield. Things are not dire, but I do think we can start to look at capping overall production numbers from the US. Not so much from yield yet, but from acreage. What this report tells me is that Indiana is going to see an acreage switch. The NW Indiana specifically is not in very good shape from those I speak with. The question is how much of a rally does this kind of news provide. Ethanol prices have rallied in recent days, creating some margin. US corn is even at the ports with Brazilian corn. I think its safe to expect a push into the 380’s before July expires. Producers with bushels in the bin face decisions at that point. 91% of the corn crop has been seeded, right on average. We should see plantings wrap up soon given the dry weather in the Midwest, but cool temps should keep conditions sideways. 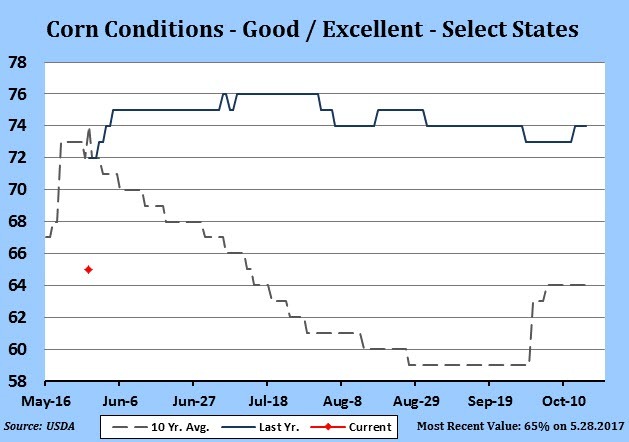 Wheat markets got some bullish price action as well from USDA as US Winter wheat conditions fell another 1% in G/E while Spring wheat ratings began their year with the lowest rating since 2008. High protein wheat could be facing some relative shortages in this coming year. 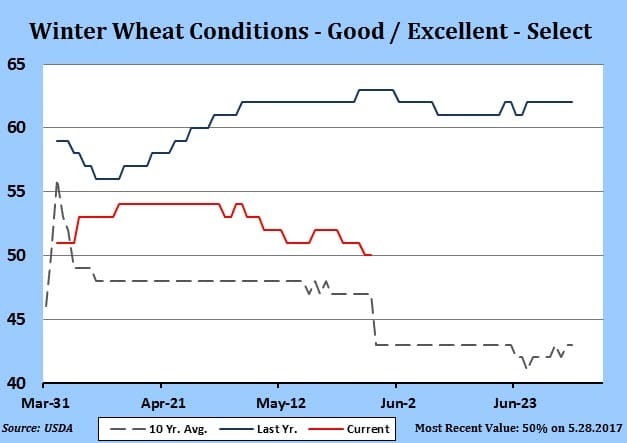 I work with folks in Texas who reported their first cargoes of wheat on rails was only at 10.7%, below normal years. This should be the trend given the wet spring. Throw in a tough conditions in the Spring wheat and a reported acreage drop in Canada, we could be printing lows sometime soon. 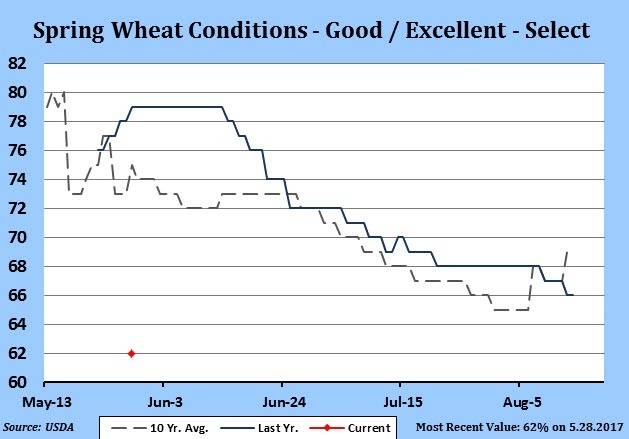 I like buying KC/Chi wheat spreads. July at 4 cents looks pretty attractive with a month to go before delivery. Soybean markets do not have the conditions/acreage story to lean on at this point in the growing year. Given the weak US domestic demand and somewhat ample old crop stocks picture, the soybean complex has begin to unwind. You can really see it in the spread markets, where July and November contracts lost over 10 cents each yesterday vs new crop 2018. Nov 18 contracts closed almost unch, which is a good first indicator for a short term bottom being forged as is the big 130 MT purchase announced. But the story out there right now is an expectation of at least 1 million more acres of beans planted and with planting pace and moisture not a problem as of right now, bean longs look to take their money elsewhere. 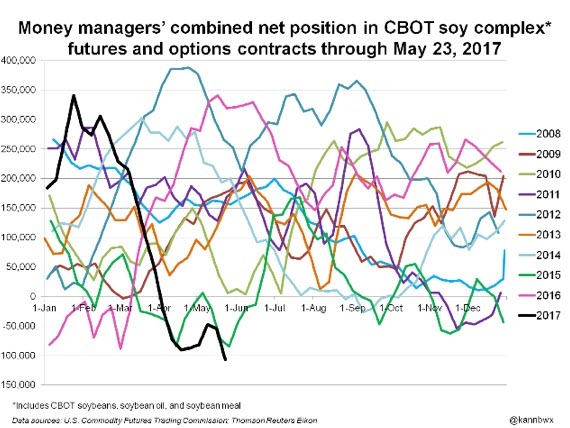 There are some solid soybean seasonals in the near future bulls can hang their hat on, and this open interest picture should help prices rally if given a reason….but right now there is not much. Chinese crush margins remain negative and there is talk of China delaying shipments through the summer to alleviate the glut. I think July sees a test of 9.00 before lows are made. Beans face a tough June 30th report to get through given the chance of higher acres. Cotton markets are going to trade as conditions in Texas dictate, and right now we are seeing Texas planting pace right on average with fantastic subsoil moisture available. The market is really long in structure right now and if the specs start to feel trend yields are in play, selling should come around. With a normal yield, ending stocks could reach a 10 year high. The lack of “Trump trade” or inflationary expectations from the globe are going to keep a lid on cotton as well. If you feel confident enough with your supplies, continue to sell rallies. Dec 2018 cotton sits in the 71 cent area, I might look at selling that contract on pushes into the 73 cent area. If you use futures you can always buy these back on a break, maybe looking to add 5-6 cents of extra margin with the high stocks story we could see as next year approaches.